Developers Flaming Fowl Studios and Mediatonic are proud to announce that Fable Fortune is out RIGHT NOW on Xbox One, Steam, and Windows 10. Players who download the game now can get their grubby mitts on a free card pack every day for the first ten days, and earn double XP until 2nd March! Developers Flaming Fowl Studios and Mediatonic announce today that Fable Fortune, the collectible card game set in the iconic world of the Fable series, will leave Early Access on February 22nd and land as a free-to-play title on Xbox One, Steam, and Windows 10. Co-developers Flaming Fowl Studios and Mediatonic are dead chuffed to announce today that Fable Fortune is out now on Xbox One and Windows 10 Game Preview, and on Steam Early Access! 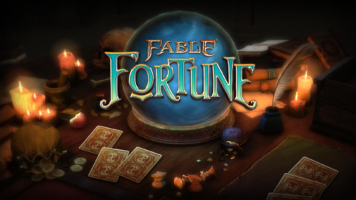 Co-developers Flaming Fowl Studios and Mediatonic announce today that fans of the Fable franchise can travel back to the whimsical and iconic world of Albion as the collectible card game Fable Fortune launches on Xbox One and PC on July 11th.